Crushed Diamonds, Filthy Rich, Orange Mantra… just a few of the goodies we sampled from the delightfully decadent Chocolate & Love. Crushed Diamonds is a smooth, dark chocolate with a lightly crunchy surprise zing of cocoa nibs inside. 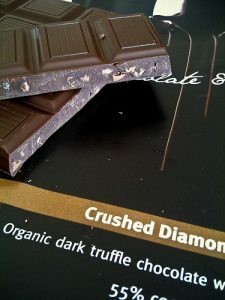 The bitter of this dark chocolate is gentle but present and the lingering flavour after the truffle-like texture is divine. This could be a new favourite chocolate bar. 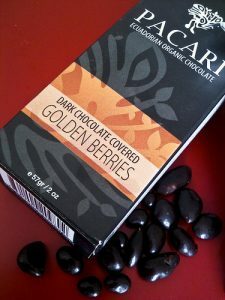 Parcari Ecuadorian Organic Chocolate has created Dark Chocolate Covered Sun Berries, and I gotta say, they are like eating sunshine. I’m not one who typically likes fruit and chocolate together, but there is a burst of sweet and natural texture in each flavour-packed tiny morsel. Unusual and delightful. Moving on from there, the most unusual item on the chocolate menu was Yummy Mummy Conscious. First of all, I really don’t like the Yummy Mummy thing. Conjures up all the wrong imagery for me when I’m about to indulge in the ultimate chocolate experience. 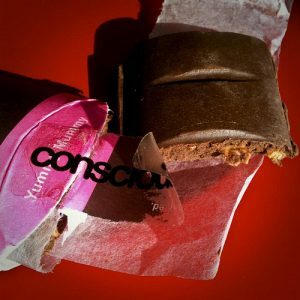 Beyond that, Conscious is a “Handmade raw chocolate with lucuma & yacon root. Free from pesticides, dairy, soya & gluten. Naturally sweetened with agave nectar.” No wonder I didn’t like it. It’s not chocolate to me. 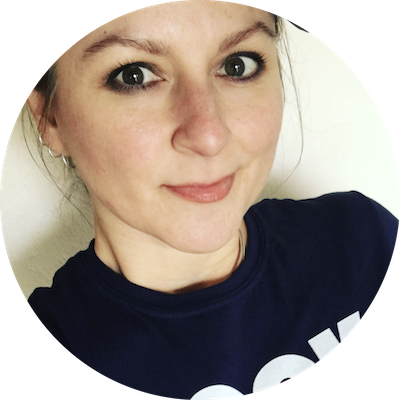 The texture is a soft, fudgy, buttery feel with an almost powdery cocoa smell. There’s a light minty hint that disappears as soon as you notice it, and then the unfinished, earthy mouthfeel leaves a chocolate lover totally unsatisfied. Shame, as I wanted to like it. Filthy Rich and Orange Mantra are both on the same level as the gorgeous Crushed Diamonds. Quality, flavour, mouthfeel– all superb. Filthy Rich is a strong 71% but the bitterness is still not offensive. It has a solid ‘chunk’ sound when you bite into it and the rich flavour is almost like a liqueur. An exceptionally good dark. Orange Mantra is the first orange chocolate I’ve ever liked. The orange is fresh and not so overpowering that the chocolate doesn’t get a say. Fine texture and a smooth and excellent aftertaste. 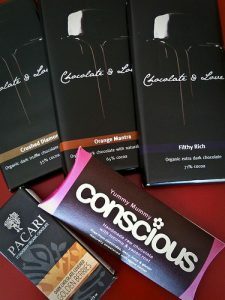 Chocolate provided for the purpose of review by Chocolate & Love. I have not been paid otherwise. Yup. It is good stuff.